Sometimes it’s hard to explain with words what a customer needs to do to resolve an issue. And it takes precious time. One screenshot could do a job of a hundred words. 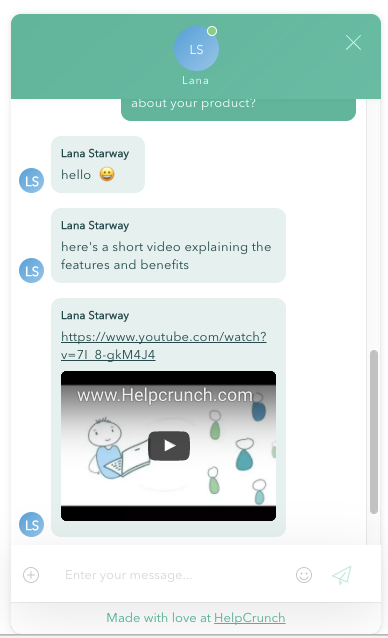 Did you know that you can share files over HelpCrunch Live chat? This cool feature is not limited to screenshots – these can be product guides, documentation, catalogs, video tutorials, webinar recordings – anything that can help your customer or market your product. You can upload them from your computer or just insert a link. Most popular formats are supported (like jpg, png, pdf etc). And sure, it works both ways – not only a support agent, but a customer can easily illustrate his/her problem instead of typing lengthy descriptions. You will see the image or the video preview (for YouTube, Vimeo, and DailyMotion videos) right in the chat window both for manual and auto messages. Speed up your support with file sharing and keep up great work!